By Stephen: suil, suil, suil arun, suil go siocair agus, suil go cuin (walk, walk, walk your way, walk in safety, walk with care). Stephen’s verse is adapted from the Irish ballad ‘Siúil A Rún’ (‘Walk, my dear’, or ‘Go, my love’). It’s echoed in Finnegans Wake in the phrase ‘who goes cute goes siocur and shoos aroun’. How far O’Nolan got in his efforts to translate Ulysses, I don’t know. He seems to have put his mind and pen to it to some extent, as the following text from the same ‘Cruiskeen Lawn’ article suggests – though again it’s hard to know for sure how much it reflects reality and how much is dramatised for style and effect or even mischief. O’Brien scholars might know more about this abandoned project. Recently a chap said to me: How’s it going? I told him it was going so-so. Slow of course. These things take time. . . . Uphill work when all decent Christians are in bed. The midnight oil. Drudgery of a special kind. Told you. Bit off more than you could chaw. You and all that B. Comm. crowd is too smart. No, no, no, I told him. The job COULD be done. There were, of course, difficulties – minute things of rhythm, luminance, impact. The acute difficulty in translation lay in the lucid conveyance of obscurity. Even the hidden thing was susceptible of diacrisis. Not in the same darkness were all dark things enwrapped. Ineluctable modality of the visible: at least that if no more, thought through my eye. Signatures of all things I am here to read, seaspawn and seawrack, the nearing tide, that rusty boot . . .
Mionshamhlíocht dosheachanta an tsofheicse; fiú an mhéid sin féin, intiniocht tré fháisnéis súl. Lorg an uile a bhfuil agam annso le sonnrú, scéag mara, leathach, an tuile i gcuaird, an bhróg úd mheirgeach . . .
My Irish is nowhere near good enough to judge the literary merits of this translation, but it sounds good to the ear, and I would tend to trust in O’Nolan’s competence: he was a native speaker who wrote often in Irish, and was an erudite polyglot receptive to puns and rarefied allusions alike. I also read a very good illustrated biography of Flann, by Peters Costello and van de Kamp, which I’m told is out of print. There are a few excerpts in this string of tweets, and on my Tumblr quotes from Flann on literature being disgusting, on recasting classic characters in fiction, and, famously, on the thrill of waiting for the German verb. Finally: anyone interested in the works of this uniquely talented and protean writer will find much to enjoy at the International Flann O’Brien Society, which publishes a terrific journal called The Parish Review, to which you can sign up by email. This entry was posted on Saturday, August 8th, 2015 at 1:10 pm and is filed under books, Ireland, literature, translation, writers, writing. You can follow any responses to this entry through the RSS 2.0 feed. You can leave a response, or trackback from your own site. Hmm. I think Myles is taking you for a ride there. I doubt he translated any more of Ulysses than he needed for this column. I don’t imagine he did a whole lot, but I’d say he did more than two lines. A man called Séamus Ó hInnéirghe translated Ulysses into Irish. The translation is not without flaws: the essay ‘An Seoigheach sa Ghaeilge’ by Alan Titley published in the book Aistriú Éireann (2008) discusses some of the difficulties faced by Ó hInnéirghe. I didn’t know about this. It must have been a colossal undertaking. Thank you for the reference. Wonderful fascinations and intricate treasures! Something about that prospect (Ulysses in Irish) seems almost Escher-ian to me. My very novice perspective on that work sees it as being structured in English, but with Irish Language aspects and flavors and textures kind of interwoven throughout. Having the main language be Irish, would need to be turned inside-out, or into a perpetual loop, or something fractal. Delightful! Adding to list: Must read Flann O’Brien! That’s pretty much how it is, Claire. And of course much of the English is Hiberno-English, which has Irish structures intrinsic to it. I’m very taken by the idea of an Irish translation. I hope you enjoy Flann, if you get around to him. It might be worth trying a local library. If you think you might take a chance on one of his novels, I’d recommend The Third Policeman first. Thanks much, I definitely will! That’s sound advice. :-) He did love to spin a yarn, but then it was often based on an element of truth. I’ve got a version of the Siúil A Rún song on CD as sung by a Breton speaker. The “written by Joyce himself” line almost had me, but the joke does go over my head. I didn’t know this singer. Listening to her now. The ‘fearsome thing’ is almost meaningless, or gets its meaning by association: the words are similar in appearance to those of the traditional Irish song. I’ve never had any patience with Joyce; I feel like telling him to shape up or ship out. Whereas Flann O’Brien is a joy. Joyce is definitely not to everyone’s taste. I think I’d have been more concerned if you had no patience with Flann! I wrote a blog post about what happened to “Shool Aroon” in America. Short version: Irish turns to gibberish. This is great, thank you. And it shows how hard it could be to reverse engineer a set of garbled lyrics even with competence in both languages. The words turn to such jelly. Can’t remember, who it was, but I remember I read: Had he not been ding dong Joyce would have written like this / him (O’Brien). There are certainly some parallels in their styles and preoccupations, Sean. And each writer had a lot of admiration for the other. I’ve never heard of O’Brien – my loss – but from those snippets of his, there was no one better to have a go at it. About that “Waiting for the German verb”: Mark Twain that he was reading a German detective story, but never found out what happened, because the last pages were torn out, and that’s where all the verbs were. 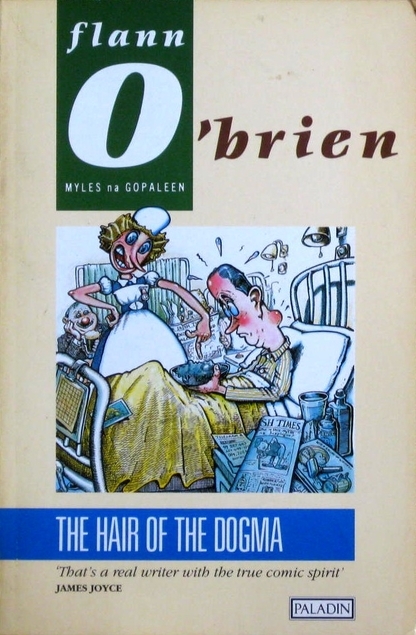 More hunting around for O’Brien (or whatever name is really his – like T. S. Eliot’s cats): we definitely need a “Skeleton Key to Flann O’Brien”. An he didn’t seem to be all that fond of Joyce’s work. A skeleton key to Flann would be a handy thing – or, as I’ve suggested elsewhere, a corpus of his texts. ‘Translating’ Finnegans Wake would defeat the purpose, but I don’t suppose that was a serious suggestion. ‘Extractum O Bhark I bPrograis’ in 1934 – mimicking the title of convenience ‘Work in Progress’ used by Joyce when publishing extracts from his last work. Maybe some Flanneur could confirm if any further Extracta were ever published by Myles? Fascinating, Val. I love the idea of a Wake translation using every dialect of Irish. Thanks for letting me know about this. Further to the above. Just noticed a mistake. The publication occurred in February 1938 ( not 1934).